Mr D has issues with his spine that affect his daily mobility, making performing tasks in the bathroom difficult. He had a large bathroom with a shower and bath in it, but they were unsuitable for his level of mobility. 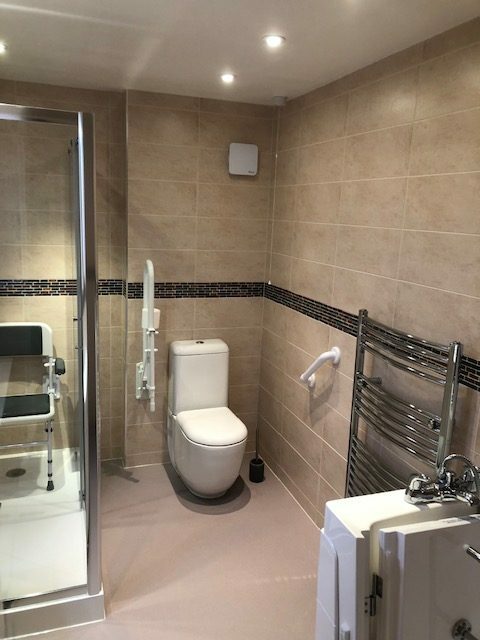 Absolute Mobility were approached to help make improvements that would make using the bathroom safer and easier to do. The shower had a surface that was slippery and he was using a bath mat to compensate. Though it reduced the slip hazard, the mat was proving to be a trip hazard for him, and the bath wall had become too difficult for him to step over. Mr D wished to make his bathroom less hazardous by installing a shower that was safe to use and a walk-in bath that was easy to access. We invited Mr D to visit our appointment only showroom in Henley for the opportunity to try a selection of full length walk in baths. These types of bath are similar to a standard bath but with the addition of a walk in door (see the Lenis, as an example). 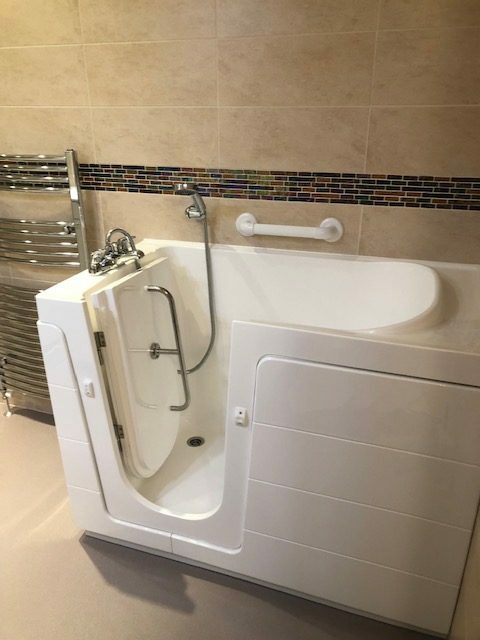 The walk in door makes it much easier to get into and out of the tub as it reduces the step height to around 8 or 9 inches (200mm to 230mm). Whilst there he could also try the shorter length tub, in which the bather sits upright in (see the Priya, as an example). For people with back problems a short length tub can sometimes prove more comfortable to use. 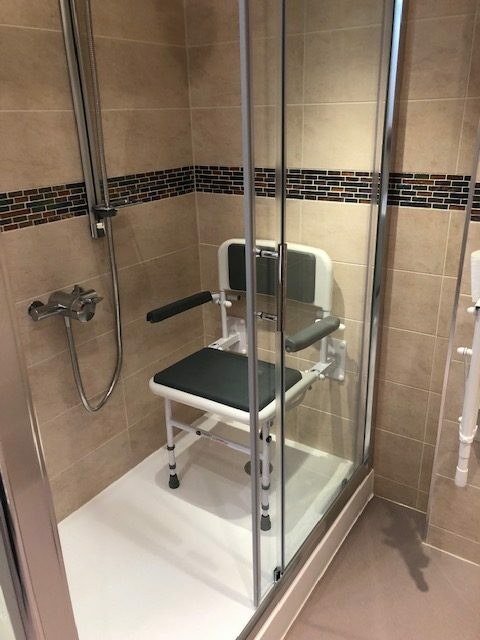 When trying out the different baths, Mr D was able to decide that the short length walk-in bath, suited his mobility far better than a full length walk-in bath. 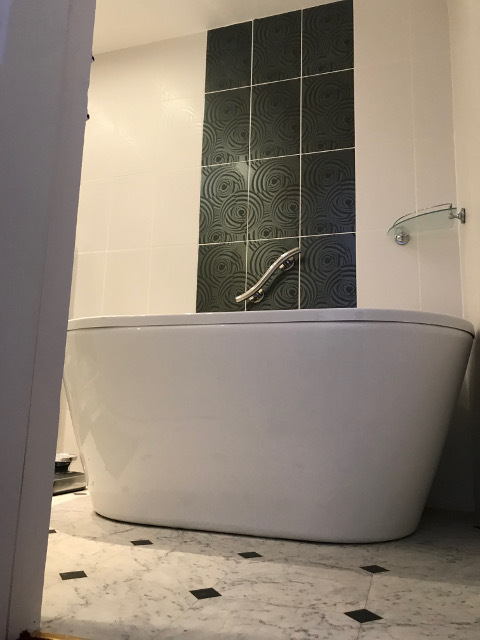 Like many of our customers, Mr D had found the visit to our showroom useful in helping him decide on which type of walk-in bath best suited his needs. We recommend that anyone in a similar situation to Mr D, makes an appointment to visit our showroom so they too can view and try a selection of the baths we have on display. This opportunity is extremely helpful in ensuring the correct bath or shower is selected for our customers needs, prior to placing an order. Having made up his mind about the walk-in bath, Mr D booked an appointment for one of our Advisors to visit and quote for the bathroom work. The job turned out to be one of our larger jobs, as we often only fit a new shower or walk in bath, rather than both in one bathroom. On checking the water system at his property we determined a twin impeller negative head pump was required to ensure the walk in bath had an adequate fill time. After discussing options with Mr D we drew up plans for a shower tray with a superior anti-slip surface, modern looking glass screens (always a popular request) and a wall fixed shower seat. 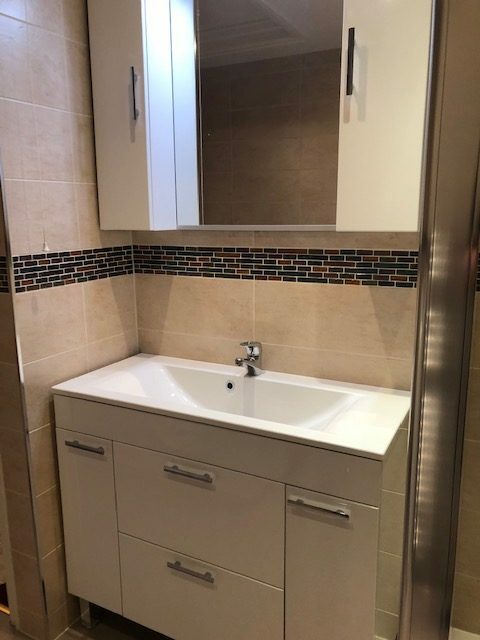 We also included an Original walk-in bath (one of the sit in type tubs), a new basin vanity unit and anti-slip flooring. At the customer’s request we re-installed his heated towel rail and WC. We added a drop down rail for the WC along with grab rails in key positions around the bath, WC and shower to assist with access. To finish the works we tiled the bathroom in tiles chosen by the customer. 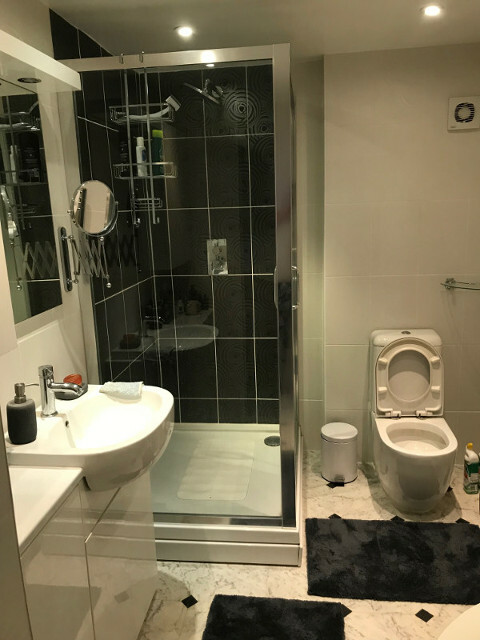 The pictures below show before and after images of the finished bathroom. 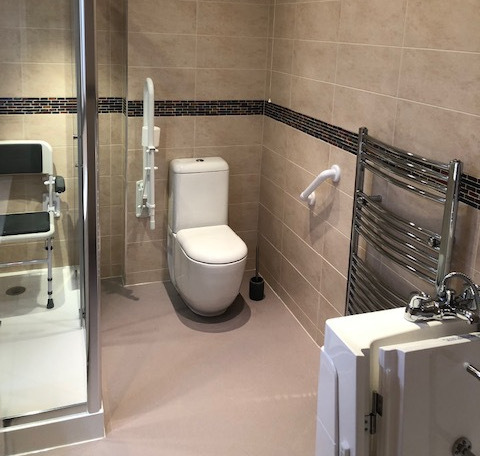 If you are interested in a new mobility friendly bathroom, please get in touch with Absolute Mobility today on 0800 2922 110.